The 2017 law school enrollment figures have been released, and they reveal flat JD enrollment and a sharp uptick in non-JD enrollment. 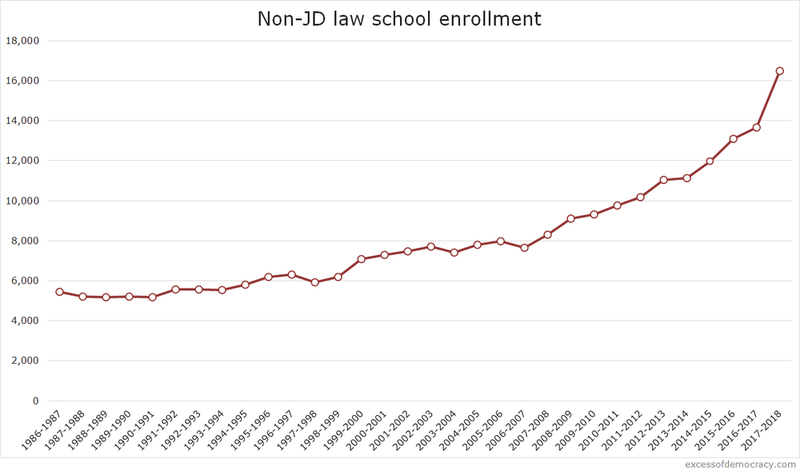 In contrast, total JD enrollment is at its lowest point since 1974, when 105,708 students were enrolled in just 157 ABA-accredited law schools. Enrollment dropped slightly from last year, down to 110,156. 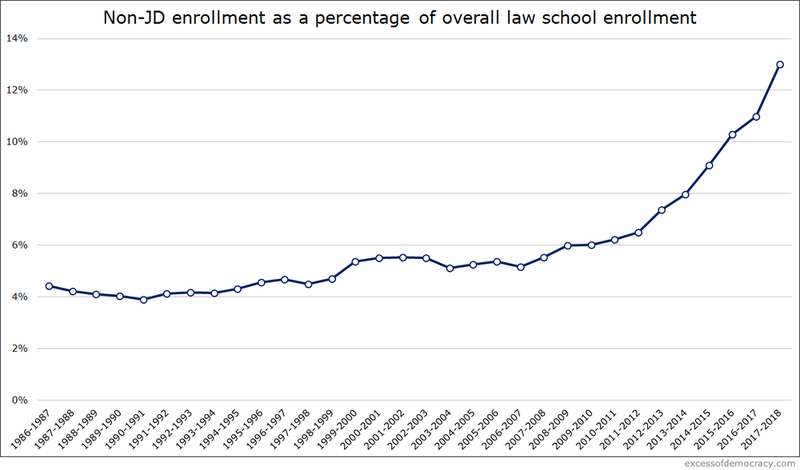 1L enrollment is actually slightly up, from 37,107 last fall to 37,398 this year. It's the fourth straight year of enrollment in the 37,000-range. Earlier I predicted that non-JD legal enrollment would decline this year due to uncertainty in immigration and travel rules from the new presidential administration. That is emphatically not the case. Instead, there's a whopping 20% increase in non-JD enrollment, from 13,677 in 2016 to 16,428 this fall. Perhaps some of this arises from the jump in non-JD online degrees, particularly "masters of legal studies"-type degrees. The growth has been explosive in recent years. When coupled with the decline and flattening of JD enrollment, the relative figures are, in my view, staggering. 13% of all students enrolled in law schools are not a part of a JD program--nearly 1 in 7 students. That's up from 11% last year, 10.3% in 2015, and 9.1% in 2017. I've earlier wondered about a coming reckoning for non-JD legal education, a market largely unregulated by the American Bar Association and with essentially no disclosure of student inputs or outcomes. And I wonder how long this trajectory might continue. In light of this enrollment data, I'll shortly project some things about the Class of 2018.